Looks like Haberdash in the Roosevelt Collection finally closed for good. Merchandise has been removed from their windows and this sign is posted on the door. While it's unfortunate to see a store close, frankly this isn't surprising. About a year ago, they closed for a couple months to "relaunch" the store. 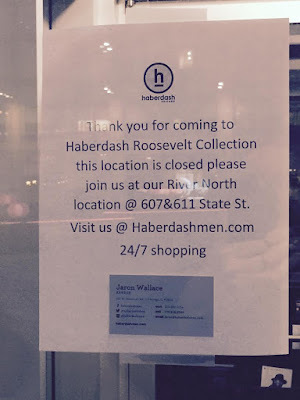 At the time, many suspected that Haberdash wouldn't reopen, but they did. The new store didn't really feel that different, but was supposed to also serve as a studio for their online stores. It was valiant effort and interesting strategy to salvage their store at Roosevelt Collection, but apparently it didn't work. In our opinion, this store was always a head scratcher to us. We really liked the store and their merchandise, but at the end of the day it was expensive. Maybe the clientele at their store on State street will pony up for this stuff, but in the Sloop it seemed like a tough sell. Yes, there is money in the Sloop, but the neighborhood seems slightly more value oriented. Anyway, business counter is updated.